Ahh, so this shiny blue R34. It uses the same casting that Jada’s had for years, so don’t expect it to be 100% movie accurate. Aggressive bodykit? Check. Oversized wheels? Check. It’s got a lot of character despite how unrealistic it may be. This particular R34 from the movie doesn’t have any standout features or graphics that make it unique, unlike the one from 2 Fast 2 Furious. Just think of it as another R34 in your collection. There are a few areas where these two differ, namely the hood, spoiler, and wheels. Which one do I like better? The silver one, for sure. Those graphics are just too iconic, and I also prefer the 6-spoke wheels. Now onto the smaller stuff. The 1/55 Build & Collect series that I’ve been searching high and low for. I now have the complete set. I feel the need to express how great the idea behind this series is from Jada’s perspective. Force the die-hard, must-have collectors to purchase the whole set just to complete that Supra, which in itself is a desirable casting in today’s JDM-crazy world. This means you can move more of the products that no one wants (read: the muscle cars here). I know I personally fell for it. Had it not been for the build-able Supra, I probably would’ve only purchased the Skyline and Lykan. The Skyline was unsurprisingly the hardest one to find. Ironically, I found another one at Toys’R’Us today, but I don’t need a second. IMO, it’s easily the best of the series. My only real complaint here is the ride height but otherwise, it’s an awesome piece. What’s nice about the 1/55 series is that these are completely new castings. 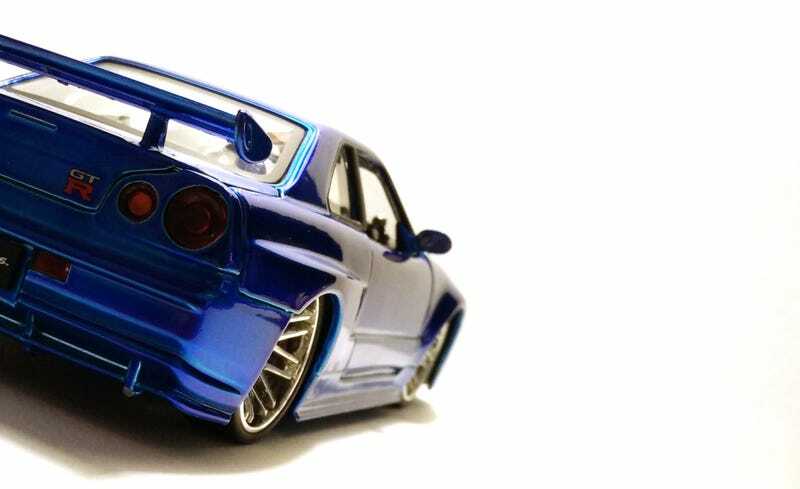 Jada didn’t simply reuse their old R34 casting like they did with the 1/24’s. They made a new one specifically tailored to match the movie car. That means the bodykit, spoiler, and wheels all match that of the real thing. It’s most evident on this Skyline. Here’s the Supra. Complete at last. Is it worth buying the whole set for this one? Maybe these pictures can help you decide. Well that’s the end folks, thanks for tuning in! I hope you guys enjoyed this post as much as I enjoyed collecting and photographing these cars!